Cloud computing has emerged as a popular computing model to support processing of volumetric data using clusters of commodity computers. Nowadays, the computational world is opting for pay-for-use models. Hype and discussion aside, there remains no concrete definition of cloud computing. 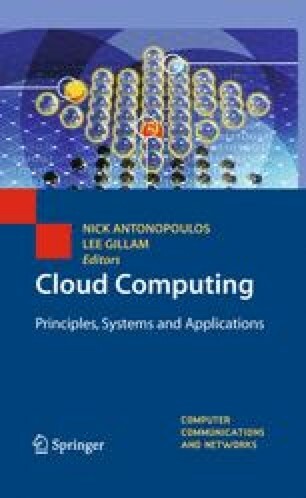 This chapter describes a comprehensive taxonomy for cloud computing architecture, aiming at a better understanding of the categories of applications that could benefit from cloudification and that will address the landscape of enterprise IT, management services, data governance, and many more. Then, this taxonomy is used to survey several cloud computing services such as Google, Force.com, and Amazon. The usages of taxonomy and survey results are not only to identify similarities and differences of the architectural approaches of cloud computing, but also to identify the areas requiring further research. This research was supported by the MKE (Ministry of Knowledge and Economy), Korea, under the ITRC (Information Technology Research Center) support program supervised by the NIPA (National IT Industry Promotion Agency) (NIPA-2009-C1090-0902-0026), and research program on Kookmin University.